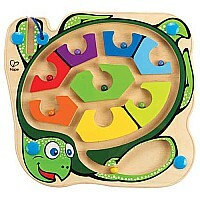 A colorful hand-powered maze encourages fine motor skills, creative problem solving, early critical thinking- and FUN! The magnetic wand helps children move the marbles into the turtles shell. Match all the colors and start over again!